It was backed by 71 countries while 25 voted against and 77 abstained. 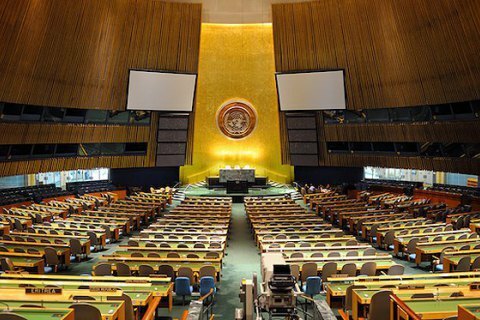 The Social, Humanitarian & Cultural Issues (Third) Committee of the UN General Assembly has approved an updated resolution on human rights in Russia-annexed Crimea. The draft resolution "Situation of human rights in the Autonomous Republic of Crimea and the city of Sevastapol, Ukraine" was supported by 71 countries while 25 voted against and 77 abstained. The draft resolution condemns the temporary occupation of part of the territory of Ukraine by Russia, the retroactive application of the legal system of Russia and the imposition of automatic Russian citizenship in Crimea, the unlawful imposition of Russian jurisdiction; urges Russia to comply with the order of the International Court of Justice on provisional measures to revoke immediately the decision declaring the Crimean Tatar self-styled government Majlis an extremist organization and to restore the right to study in Ukrainian and Crimean Tatar languages; reaffirms concern that the human rights monitoring mission in Ukraine continues to be denied access to Crimea, despite its existing mandate. Russia, Belarus, Armenia, Kazakhstan, China, South Korea, Serbia and Uzbekistan did not support the draft resolution. In December, it may be put to vote at the General Assembly. Earlier, Foreign Minister Pavlo Klimkin said that Ukraine would use the resolution on human rights in Crimea in international courts, including the International Court of Justice. Saakashvili threatens with "people's impeachment"